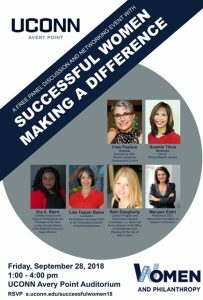 For the second year, the UConn Department of Women and Philanthropy is hosting a free program for the public called Successful Women Making a Difference. 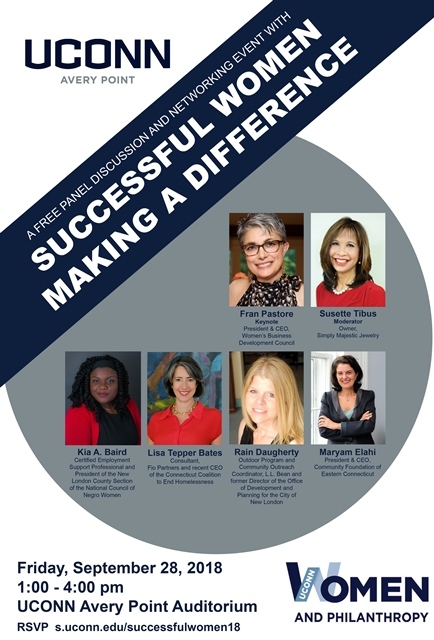 This event consists of a panel discussion and networking opportunities with strong and successful women in the region who will share their stories, contributions, and ideas about success. When: Friday, September 28, 2018 from 1:00 p.m. to 4:00 p.m. Please RSVP by September 21st here. If you require an accommodation to participate or have any dietary needs, please specify this in your RSVP. For questions, please contact Marcy Jarzabek via email or at (860) 486-3905.